Pre-alpha Mage accepting a quest. 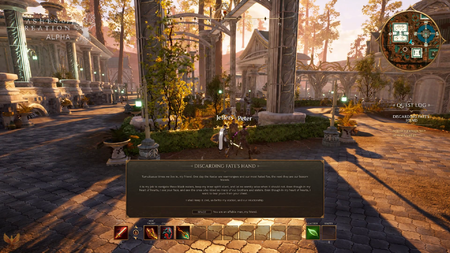 Quests in Ashes of Creation are divided into three categories: Events, Tasks and Narrative quests. We’re going to be breaking up what is traditionally called ‘questing’ into three different categories: Narratives, Events, and Tasks. We want to avoid going down the path of trying to force narrative into gameplay where it doesn’t really fit (ie: filler stuff that doesn’t really relate to what’s happening in the world). What you find in the Narratives category is where you’ll find most of what you might call traditional quests. Because we’re jettisoning filler, we’ll have the resources to craft a really excellent story, with gameplay that reflects the scope of that story. 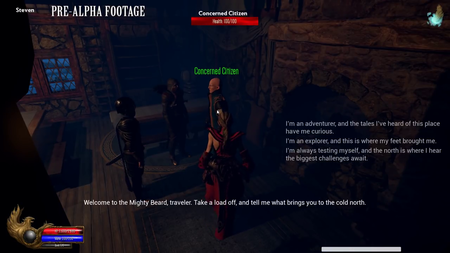 Epic and Legendary quests affect the narrative of the game. 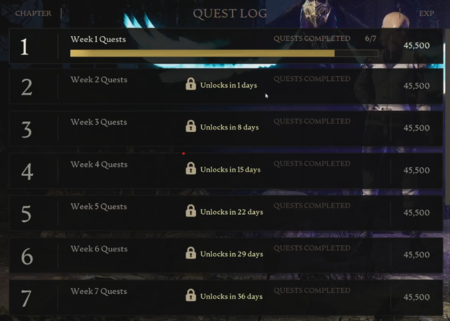 These quests will unlock gated content. Daily quests will not be the same as past experiences. There will not be an obligation to log each day. Will likely not be RNG based. Focused around how changes in the world relate to a player's opportunities. Location matters due to the lack of fast travel. Questing may be individual and group oriented. 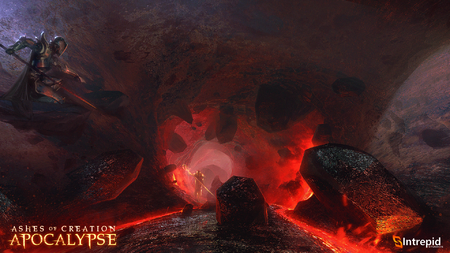 There will be collection quests. There will be subtle ways that players will acquire knowledge that something is to be done in an area. 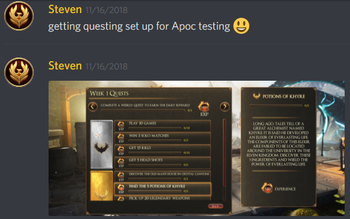 There are not going to be obvious quest markers such as question marks and exclamation marks telling players where to turn. Players can sponsor quests on a bulletin board. ↑ Livestream, 13 December 2018 (12:30). ↑ Video, 30 May 2017 (1:38). ↑ 3.0 3.1 Livestream, 15 May 2017 (20:58). ↑ 5.0 5.1 Livestream, 3 May 2017 (46:18). ↑ 7.0 7.1 7.2 7.3 Interview: Ashes of Creation on Building Their Virtual World, 13 April 2017. ↑ 16.0 16.1 16.2 Livestream, 12 May 2017 (42:17). ↑ 19.0 19.1 19.2 Interview, 20 October 2018 (2:36:25). ↑ Livestream, 8 May 2017 (50:32). ↑ 23.0 23.1 23.2 23.3 Livestream, 8 April 2018 (PM) (55:49). ↑ 24.0 24.1 Livestream, 9 July 2018 (25:34). ↑ 27.0 27.1 27.2 27.3 27.4 27.5 Interview, 17 August 2018 (23:47). ↑ 28.0 28.1 28.2 Livestream, 15 May 2017 (26:13). ↑ 30.0 30.1 30.2 30.3 Podcast, 23 April 2018 (29:56). ↑ 33.0 33.1 33.2 Livestream, 6 December 2018 (28:45). ↑ 34.0 34.1 34.2 34.3 34.4 2018-12-08 Newsletter. ↑ 35.0 35.1 35.2 35.3 Livestream, 6 December 2018 (26:12). ↑ 41.0 41.1 41.2 Livestream, 18 January 2018 (39:08). ↑ Livestream, 26 May 2017 (48:48). ↑ Livestream, 22 May 2017 (52:39). ↑ Livestream, 31 October 2017 (30:34). ↑ 53.0 53.1 Livestream, 4 June 2018 (2:18).